Alistair is a knife maker who strives to excel with each knife I create. I love to create folding knives with high quality modern materials and a variety of mechanisms. I craft knives both by hand and using modern methods such as CNC. Have a look around at the knives I have made in the past, learn a bit more about my history as a knife maker, collaborations with Spyderco and connect with my social media accounts. My interest in knife making began in 2004 after I attended a knife making course taught by Karim Haddad at the Tharwa Valley Forge in Canberra, Australia. I had always had an interest in folding knives and very quickly I began to specialize in the craft of making a folding knife. One of the favorite aspects of making knives is the fine-tuning process of getting a folder’s action just right. I define myself as a “spare-time knife maker,” as I work full time as a Programmer of games, apps and interactive exhibits. Knife making happens in the down time between projects and on weekends and evenings. A full member of the Australian Knife makers Guild, one of my proudest moments was winning the award for the Best Folding Knife at the 2012 Australian Knife makers Guild show with a stag-handled three-bladed stockman folder. My collaboration with Spyderco knives for the Kapara model is another highlight in my knife making career. The Kapara was released in 2018 based on my Redback model. My Redback model came about from the need for a food preparation knife. I was looking to prepare some healthy fresh lunches and wanted to create a knife to fulfill my needs. 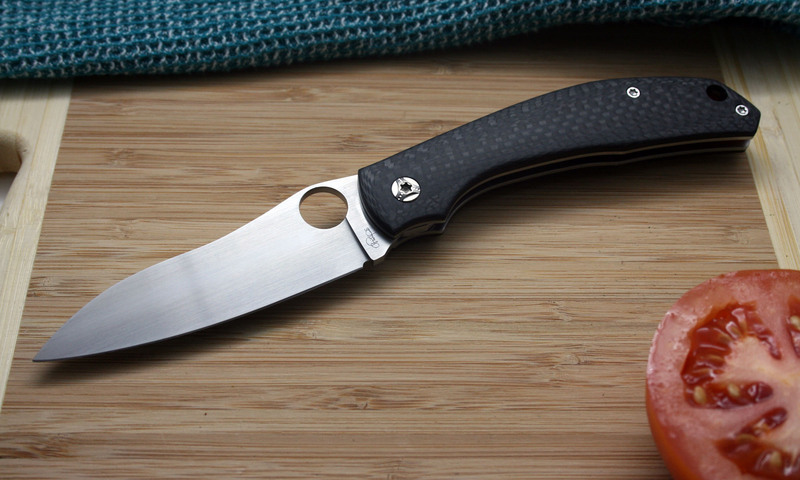 The Spyderco Round Hole allows for ambidextrous opening, the RWL34 blade has a full flat grind coming to a thin edge for great slicing. The compression lock keeps the lock out of the way of any food that might get trapped in there. Titanium liners and carbon fibre scales keep the weight down for a great EDC knife. One of the most anticipated Spyderco knives of 2018, the Kapara is my first collaboration with Spyderco. The design is based on my Redback folder. Its CPM® S30V® stainless steel blade is full-flat ground and has a fully accessible Trademark Round Hole™ for ambidextrous one-handed opening. The handle has full, skeletonized stainless steel liners that provide structural strength and form the basis of the knife’s patented Compression Lock™ mechanism. The carbon fiber scales are precisely crowned to provide a secure, extremely comfortable grip in a slender profile. The Kapara includes a reversible deep-pocket wire clip for left or right-side, tip-up carry. If you have any questions about me or my knives please feel free to contact me.